Hibs striker Dominique Malonga came off the bench for Congo to help them rescue a point in the opening match of the 2015 Africa Cup of Nations against Equatorial Guinea. Congo trailed the host nation 1-0 in Bata on Saturday after Emilio Nsue, who plays his club football for Middlesbrough in the English Championship, put his country ahead on 16 minutes. However, Congo manager Claude Le Roy brought on Malonga with 12 minutes left and the former Torino hitman made an instant impact, slipping Thievy Bifouma through to score the equaliser after 83 minutes. 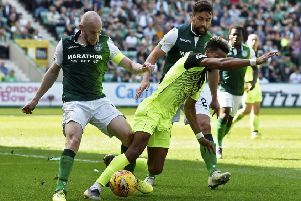 It could have been even better for Malonga in the 88th-minute when he timed his run perfectly to meet a Ladislas Douniama cross, but he shot straight at the keeper from seven yards as the game ended in a draw. Malonga will be expected to play a part in Congo’s next match against Gabon on Wednesday. The Gabonese top group A after they defeated Burkina Faso 2-0, with Borussia Dortmund striker Pierrick Aubameyang on target. Yannick Bolasie earned the Democratic Republic of Congo a point in their Group opener against Zambia. Zambia were ahead just 62 seconds in through Given Singuluma but Crystal Palace forward Bolasie fired home the equaliser midway through the second half. In the same group, Tunisia and Cape Verde also played out a 1-1 draw. Tunisia, the 2004 champions, went ahead through Mohamed Ali Moncer in the 70th minute but Nhuck Heldon earned Cape Verde a point with a penalty 13 minutes from time. In today’s encounters, Ghana face Senegal at 4pm, while Algeria face South Africa at 7pm.